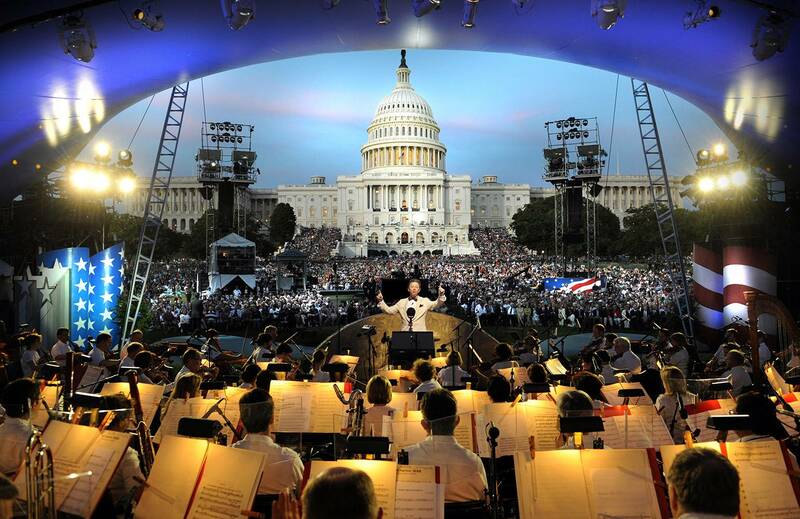 Photo: Maestro Jack Everly will lead the National Symphony during the 27th annual broadcast of the NATIONAL MEMORIAL DAY CONCERT, live from the West Lawn of the U.S. Capitol. Courtesy of Capital Concerts. Arlington, VA, May 27, 2016 – PBS honors the service of men and women in uniform this May with the NATIONAL MEMORIAL DAY CONCERT and several new programs that explore the lasting effects of war on our service men and women. The long-time PBS broadcast of the NATIONAL MEMORIAL DAY CONCERT, which for 27 years has paid tribute to America’s military. airs live from the West Lawn of the U.S. Capitol, Sunday, May 29, 2015, 8:00-9:30 p.m. ET, with an immediate re-broadcast at 9:30 p.m. For the 11th year in a row, Tony Award-winner Joe Mantegna and Emmy Award-winner Gary Sinise, longtime champions of veterans’ causes, will co-host the broadcast of this night of remembrance. The 27th annual broadcast of the NATIONAL MEMORIAL DAY CONCERT kicks off with Trent Harmon, the final winner of “American Idol,” singing the national anthem and features appearances by Gen. Colin L. Powell USA (Ret. ); renowned four-time Grammy Award-winning classical superstar Renee Fleming; iconic music legends The Beach Boys; gifted actress and singer Katharine McPhee; country music star and Grammy-nominated member of the Grand Ole Opry, Trace Adkins; Emmy, Golden Globe and SAG Award-winning actress S. Epatha Merkerson; award-winning actor Esai Morales; and Tony Award-winning international sensation Alfie Boe. Also participating in the event are the U.S Joint Chiefs of Staff with The U.S. Army Herald Trumpets, The U.S. Army Chorus, The Soldiers’ Chorus of the U.S. Army Field Band, The U.S. Navy Band Sea Chanters, The U.S. Air Force Singing Sergeants, the Armed Forces Color Guard and Service Color Teams provided by the Military District of Washington, D.C.
PBS Memorial Day programming continues on Monday, May 30 with TED TALKS “War and Peace,” which features men and women who have experienced war from different perspectives — fighters, journalists, psychologists, doctors and peacemakers — for a look at its devastating impact. Former Marine-turned actor Adam Driver reveals his passion for the arts and the armed forces, and award-winning journalist and filmmaker Sebastian Junger examines the tribal nature of war. The program also features music from Rufus Wainwright and short films from award-winning independent documentarians. Hosted by author and activist Baratunde Thurston, TED TALKS “War and Peace,” airs on Memorial Day from 9:00-10:00 p.m. ET. Also airing on Monday, is POV “Of Men and War,” an exploration of the psychological trauma of war experienced by a group of American veterans upon their return from the front in Iraq. Anger consumes a dozen combat vets, and long after their return from the front their minds are still on the battlefield. Ghosts and traumatic echoes of the war fill their lives, and threats seem to spring from everywhere. Wives, children and parents bear the brunt of their fractured spirits. At the Pathway Home, a first-of-its-kind PTSD therapy center, these veterans resolve to end the ongoing destruction. Their therapist is a Vietnam veteran, helping the young men forge meaning from their trauma. “Of Men and War” is directed by Laurent Bécue-Renard and will air on Memorial Day from 10:00-11:30 p.m. ET. Starting June 1, a 10-part digital series, Veterans Coming Home, will premiere on PBS.org using storytelling, media and dialogue to help veterans and communities understand the opportunities and challenges faced during a veteran’s transition to civilian life and to help bridge the military-civilian divide. Produced by The Kindling Group and Wisconsin Public Television with 13 other PBS stations, new episodes will premiere twice each week through the Fourth of July as part of PBS Stories of Service. Episodes from Veterans Coming Home will also be featured on partner sites and later in the year on public media’s World Channel. Launched in May 2014, PBS Stories of Service is part of a public media initiative with the Corporation for Public Broadcasting’s Veterans Coming Homeproject designed to provide a deeper understanding of our nation’s military history and to increase dialogue as our nation’s veterans transition to civilian life. The initiative includes national, multi-platform content as part of Stories of Service on PBS, and funding by CPB for local station productions, national productions, and community engagement. The NATIONAL MEMORIAL DAY CONCERT, TED TALKS “War and Peace” and Veterans Coming Home are funded in part by CPB. In 2017, PBS will air Ken Burns’ and Lynn Novick’s THE VIETNAM WAR, with major funding provided by CPB, as part of PBS Stories of Service. The Corporation for Public Broadcasting (CPB), a private, nonprofit corporation created by Congress in 1967, is the steward of the federal government's investment in public broadcasting. It helps support the operations of nearly 1,500 locally owned and operated public television and radio stations nationwide. CPB is also the largest single source of funding for research, technology and program development for public radio, television and related online services. For more information, visit cpb.org and follow us on Twitter (@CPBmedia), Facebook and LinkedIn.